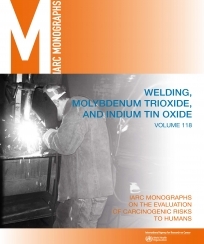 This volume of the IARC Monographs provides evaluations of the carcinogenicity of welding and welding fumes, molybdenum trioxide, and indium tin oxide. Worldwide, an estimated 11 million workers have a job title of welder, and around 110 million additional workers probably incur welding-related exposures. Welding can involve exposures to fumes, gases, ultraviolet radiation and electromagnetic fields, and co-exposures to asbestos and solvents. The extent and type of exposure can depend on the process used, the material welded, ventilation, degree of enclosure, and use of personal protection. Molybdenum trioxide, which occurs rarely naturally, is a chemical with a high production volume that is mainly used in steel manufacture, but also in biocides and in photovoltaic technology. Most occupational exposures occur in mining and metallurgy, steel foundries, welding, and other high-temperature processes using steel. Indium tin oxide, which does not occur naturally, is a chemical with a low production volume that is a mixture of indium oxide and stannic oxide. It is mainly used in producing transparent conductive films on glass or plastic panels used in electronic devices. Exposure to indium tin oxide occurs mainly in occupational settings, during production and processing, or during recycling of elemental indium. As the use, recycling, and disposal of electronics increases worldwide, exposures to indium in low- and middle-income countries where informal e-recycling occurs are also expected to increase. An IARC Monographs Working Group reviewed epidemiological evidence, animal bioassays, and mechanistic and other relevant data to reach conclusions as to the carcinogenic hazard to humans due to exposure to these agents.